Our Lady of La Vang is the central and national shrine of Vietnam, approximately 60 kilometers from the former capital Hue. The name Lavang is derived from a type of fern which used to grow in great quantities in the region of Central Vietnam. Lady of La Vang first appeared to the Vietnamese people in 1798 during a most grievous persecution of Vietnamese Catholics and missionaries that began and lasted until 1886. After the persecution in 1802, the Christians left their jungle hiding place and returned to their villages. However, the story of the apparitionand its message was passed on. In 1820 a chapel was built at the apparition site. The chapel grew larger to accommodate the ever growing attendees, who drew from the faithful or curious non-believers. 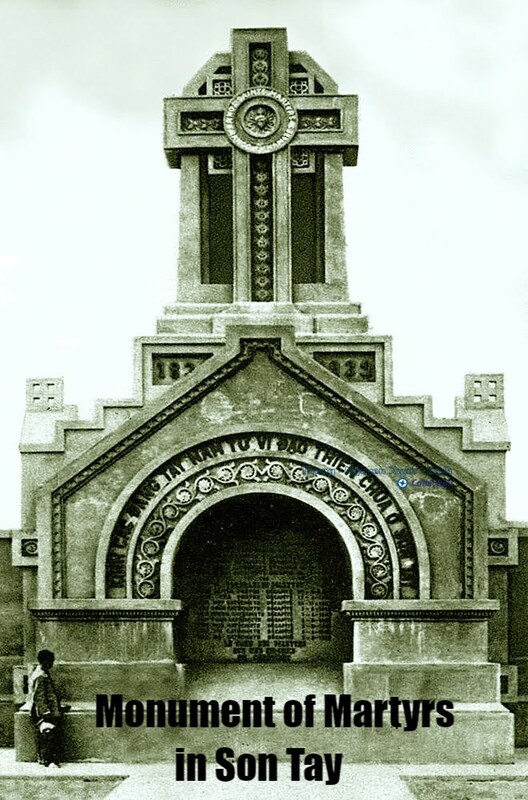 In 1885 the chapel in honor of Our Lady of La Vang was destroyed by a fanatic. 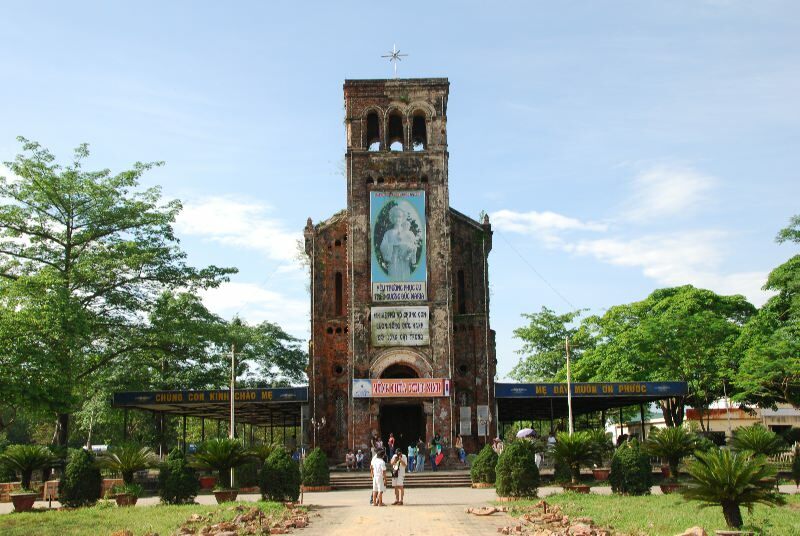 After the persecution had officially ended, Bishop Gaspar ordered a church to be built in honor of the Lady of La Vang. Due to its precarious location and limited funding, it took 15 years for the completion of the church of La Vang. 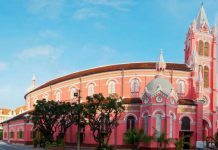 It was inaugurated by Bishop Gaspar in a solemn ceremony that was participated by over 12,000 people and lasted from August 6th to 8th of 1901. The Bishop proclaimed Our Lady of La Vang as the Protectorate of the Catholics. In 1886, when the persecutions had finally ended, the construction of a larger church was began. When it was finished in 1901, Our Lady of LaVang was proclaimed as the patron saint of Vietnamese Catholics by the Vatican Apostlelic representative in Saigon. Soon it was no longer able to hold the many pilgrims to La Vang, and in 1923 a new and bigger church was erected. It was consecrated in 1928 (August 22) in the presence of 20,000 pilgrims. Every three years a national pilgrimage was organized for the whole country which was to have a special meaning even after the separation of South and North. In 1959 La Vang was officially declared a national shrine, marking the 300 years of the Christianity in Vietnam (AAS 51 (1959) 84-86). The Church of La Vang was made a basilica minor in 1961. This church was destroyed in the summer of 1972 during the Vietnam war. The history of Our Lady of La Vang continues to gain greater significance as more claims from people whose answered prayers were validated. 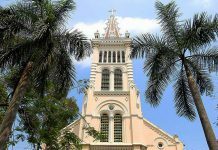 In April of 1961, the Council of Vietnamese Bishops selected the holy church of La Vang as the National Sacred Marian Center. In August of 1962, Pope John XXIII elevated the church of La Vang to the Basilica of Lavang. On June 19, 1988, Pope John Paul II in the canonizing ceremony of the 117 Vietnamese martyrs, publicly and repeatedly recognized the importance and significance of Our Lady of La Vang and expressed a desire for the rebuilding of the La Vang Basilica to commemorate the 200th anniversary of the first apparition of Our Lady of La Vang in August of 1998. Pope John Paul II called the basilica to be rebuilt and stressed the importance of our Lady of LaVang in the devotion of Vietnamese Catholics who have suffered much from war and post -war persecution. Several communities in the United States took Our Lady of LaVang as their patron saint as well. The most ambitious project for Vietnamese abroad was the construction of a chapel in Basilica of Immaculate Conception in Washington, DC. King Canh Thinh knew that Nguyen Anh received support from the French missionary and worried that the Vietnamese Catholics would also endorse his reign. He began to restrict the practice of Catholicism in the country. 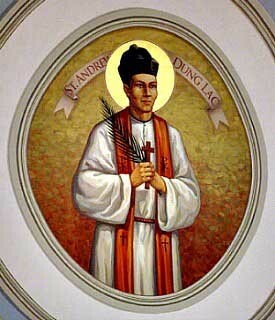 On August 17, 1798, King Canh Thinh issued an anti-Catholic edict and an order to destroy all Catholic churches and seminaries. A most grievous persecution of Vietnamese Catholics and missionaries began and lasted until 1886. Even after Nguyen Anh succeeded in reclaiming his throne as Emperor Gia Long (1802-1820), his successors, Emperor Minh Mang (1820-1840), Emperor Thieu Tri (1841-1847) and Emperor Tu Duc (1847-1884), continued the vehement campaign against Catholics, ordering punishments that ranged from branding their faces to death by various cruel methods for Vietnamese Catholics and missionary priests. The name to the location varied as local dialects took references. Some said the name Lavang is from the word for Yellow Leaves (Vietnamese: Lá Vàng), or Striped Leaves (Vietnamese: Lá Vằng), while some argued that it is from the words for Yelling Loud (Vietnamese: La Vang). The word was transformed through word-of-mouth and French influence into LaVang. Nevertheless, it began as royal decrees were enforced by series of fierce persecution on Vietnamese Catholics. All Catholic Churches and seminaries were destroyed and Catholic lay people and priests were maimed or killed in gruesome ways. In the year 1798, Our Lady of LaVang first appeared. Catholics from the town of Quang Tri had come to the forest of LaVang to hide. They suffered from cold, were in fear of wild animals and were sick with jungle ever and hunger. During the night they prayed the rosary under a banyan tree; and while praying one night they saw an apparition of a woman in a long cape, with a child in her arms, and with an angel at each side. They recognized the woman in the apparition of Mary, the mother of Christ. The Holy Mother comforted the people and told them how to make medicine for their sickness from the leaves of the surrounding trees. She also told them that whoever came to this place to pray would have their prayers answered. Through out the almost one hundred years of persecutions as many Vietnamese Catholics were burnt alive for the faith. Many unconfirmed apparitions continued for people who came to that spot in the forest to pray, even to this day. From the first apparition a small chapel had been built. When the Nguyen Dynasty finally gave in to French ships bombardment, the Emperor issued decrees to end Christian persecutions. Unfortunately, over-zealous supporters continued the traditions of razing Christian villages and forcing Christian women to marry Buddhist men. These operations, called Văn Thân, after a obscured magistrate, continued to terrorize early Christianity. The history of the Lady of Lavang continues to gain greater significance as more claims from people whose prayers were answered were validated. In April of 1961, the Council of Vietnamese Bishops selected the holy church of Lavang as the National Sacred Marian Center . In August of 1962, Pope John XXIII elevated the church of Lavang to The Basilica of Lavang. The original chapel, made of straw, soon became too small. 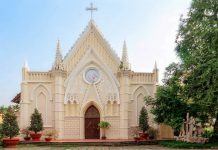 From 1885, several chapels were built one after another: the last, with its three small huts, was blessed in 1928 by Bishop Eugene Maria Giuseppe Allys (Ly, in Vietnamese), who was then Vicar Apostolic of Hue. On 13 April 1961, the Bishops of South Viet Nam assembled in Hue, made a vow to the Immaculate Heart of Mary to consecrate a church to the Blessed Virgin when circumstances permitted, asking Our Lady for freedom for the Church and peace for both parts of Viet Nam. In their joint Letter of 8 August of the same year, La Vang was recognized as a national Marian Centre. On the 22nd of the same month, its church was raised to the dignity of a Minor Basilica by Pope John XXIII. From 1961 the shrine was enlarged and embellished: Holy Rosary Square, 30 x 480 metres, with 15 statues representing the mysteries of the Rosary; two small lakes in six hectares of land; an altar made of precious stones from Non Nuoc, in the Province of Da Nang; a statue of the Blessed Virgin; retreat houses, completed in 1963; the House of the Pilgrim, a fountain, etc…. The Holy Father recently said, “In visiting the shrine of Our Lady of La Vang, who is so loved by the Vietnamese faithful, pilgrims come to entrust to her their joys and sorrows, their hopes and sufferings. In this way, they call on God and become intercessors for their families and nation, asking the Lord to infuse in the heart of all people feelings of peace, fraternity and solidarity, so that all the Vietnamese will be more united every day in the construction of a world based on essential spiritual and moral values, where each one will be recognized because of his dignity as a son of God, and be able go in freedom and as a son toward the Father of Heaven, ‘rich in mercy’ “. .